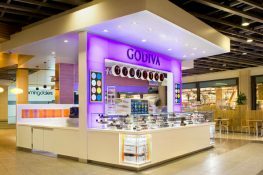 Designing temporary structures means finding flexible solutions and recyclable materials in order to avoid waste. 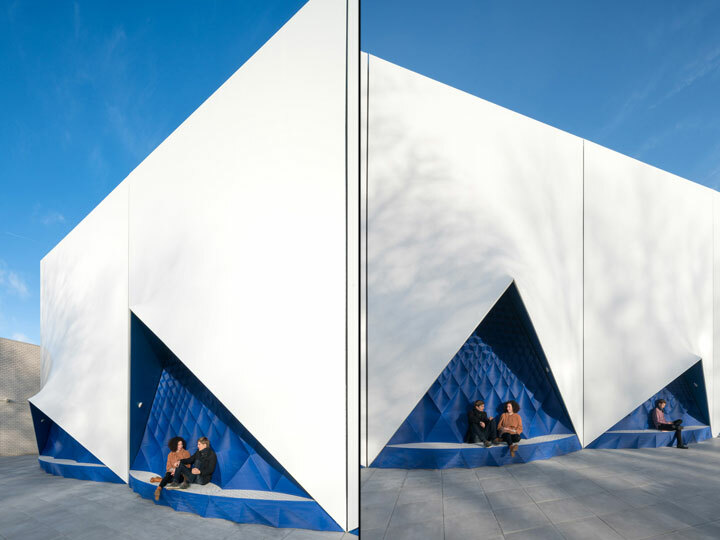 It is exactly what DUS Architects of Amsterdam did when coming up with the façade of the Mobile European Building, the place where the presidency meetings of the European Union Council took place for the first half of 2016. Since the EU meetings were to move to Slovakia for the second half of the year, it was important that this temporary structure used reusable materials. 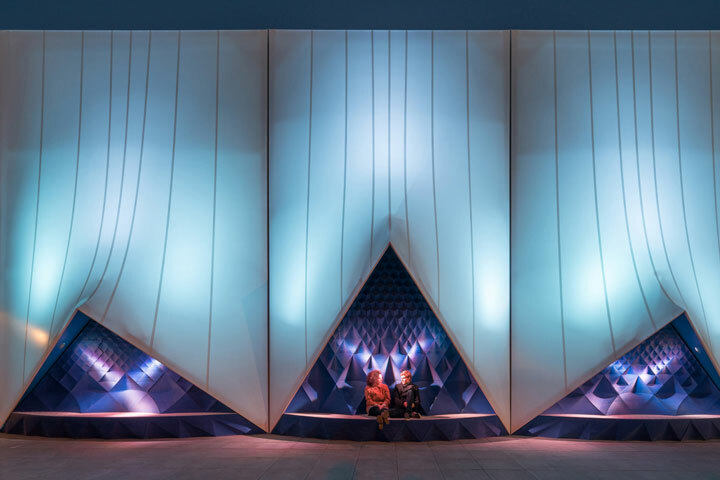 DUS Architects opted for a combination of tensile fabric, often found in mobile structures, and an innovative 3-D printed bioplastic. 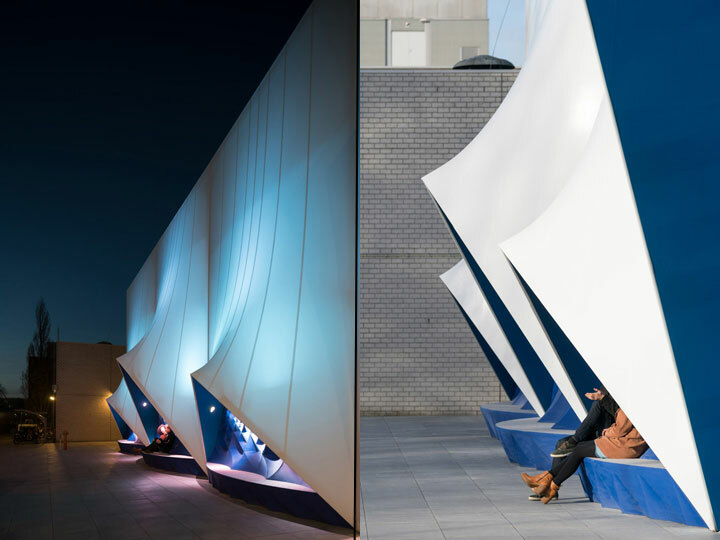 The result was a façade architecture that catches in its lines the silhouette of sailing ships. The choice was guided by the tradition of this Dutch area, where sailing ships were once built. 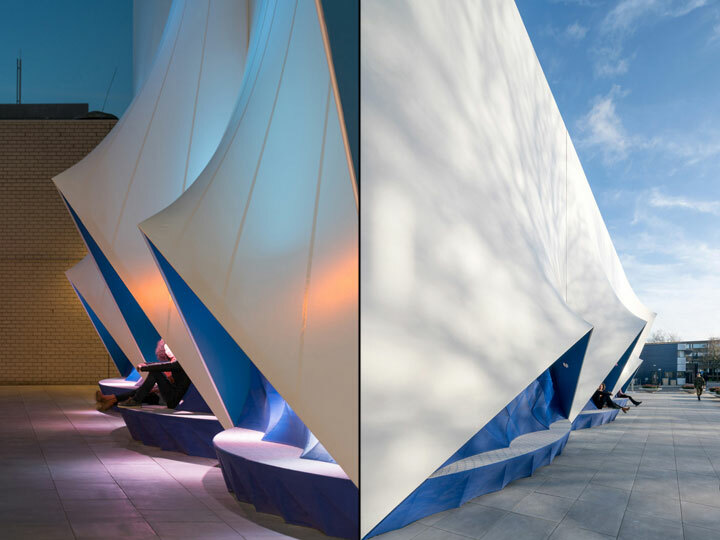 The façade structure consists of large fabric panels curved at the bottom to create the look of sheltering tents. 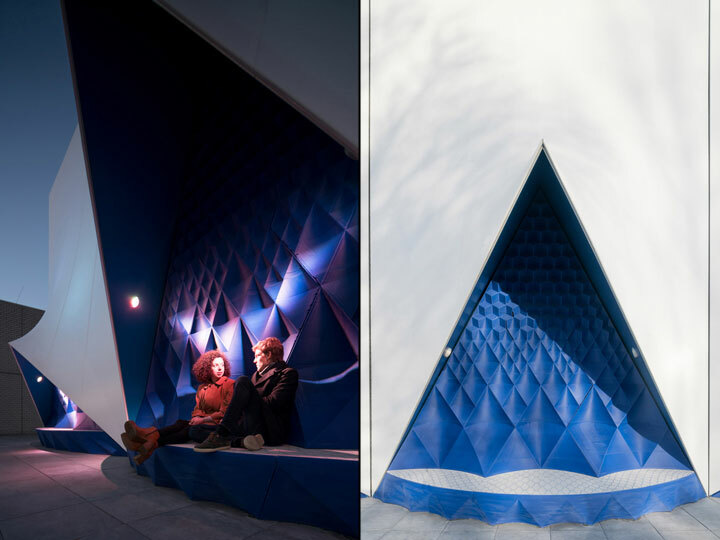 In these crevices, three-dimensional printed structures create a blue, faceted background that takes the sailing ship metaphor one step further. These surfaces continue into the foreground, giving shape to long benches. While 3-D printing on a small scale using fused deposition modelling (or FUD) is not necessarily news anymore, doing it at this scale is still a novelty. 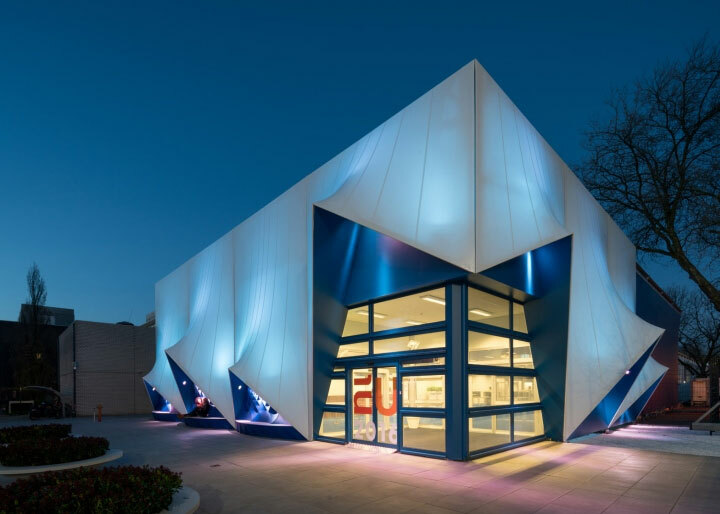 The studio collaborated with Henkel (a company also concerned with sustainability) in creating an entirely bio-based plastic material as the base for the façade structures. 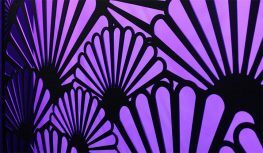 The material is made of linseed oil and can be shredded in order to be reused in the 3-D printing process. 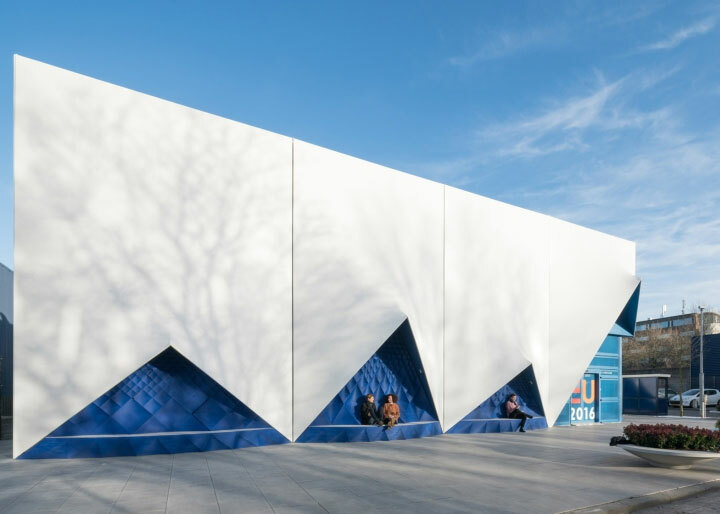 Created in collaboration with the building company Heijmans, the Mobile European Building façade is an example of inspiring design and smart use of innovative materials.